Liberal started and finished strongly on their way to a 60-39 win over Hutchinson Trinity Saturday in Cheney. The Redskins bolted to leads of 9-2 and 17-6 over the class 3A Celtics and begin the game with an alley oop dunk to Kylan Thomas. But Liberal struggled throughout the second and third quarters leading 17-11 after one quarter and 22-17 at the half. The Celtics tied the game at 29-29 as the Redskin half court offense sputtered. But the Redskins slapped a full court press on the overwhelmed Celtics jettisoning the Skins to a 21-1 run to tuck game away taking a 50-30 lead. Cade Hinkle scored 14 while Kylan Thomas added 13 and Kaiden Bigham dropped in 11. Markalyn Eatmon added nine. After making 9-14 three’s Thursday against Hereford, LHS made 3-16 three’s against the Celtics. 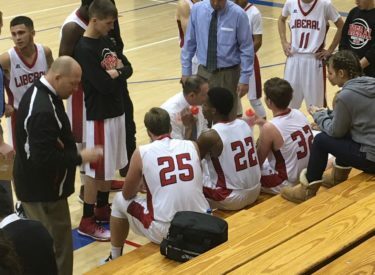 Liberal is 4-0 for the first time since 2008-09 when they began the season 5-0. The Celtics are 1-3. Liberal hosts Perryton Friday night at about 7:45 in the Big House on 1270 and kscbnews.net.